TÓ eg tali við tungum manna og eingla, og havi ikki vælvild, eri eg vorðin sum ljómandi messing, ella klingandi glymskál. Formar av messing hava verið í brúki síðan forsøguliga tíð. Fyrstu sløgini av messing kunnu hava verið náttúrligar málmblandingar gjørdar við at smelta kopar málmar, sum høvdu frá náttúrunnar hond nógv zink í sær. Messing, t.e. kopar við zinki, hevur verðið gjørt úr metaliskum kopari og zink mineralum við brúki av eini sementerandi prosess heilt frá romversku tíðini. Although forms of brass have been in use since prehistory, its true nature as a copper-zinc alloy was not understood until the post medieval period because the zinc vapor which reacted with copper to make brass was not recognised as a metal.The King James Bible makes many references to “brass”. The Shakespearean English form of the word ‘brass’ can mean any bronze alloy, or copper, rather than the strict modern definition of brass.The earliest brasses may have been natural alloys made by smelting zinc-rich copper ores.By the Romanperiod brass was being deliberately produced from metallic copper and zinc minerals using the cementation process and variations on this method continued until the mid 19th century. It was eventually replaced by speltering, the direct alloying of copper and zinc metal which was introduced to Europe in the 16th century. In West Asia and the Eastern Mediterranean early copper zinc alloys are now known in small numbers from a number of third Millennium BC sites in the Aegean, Iraq, the United Arab Emirates, Kalmykia, Turkmenistan and Georgia and from 2nd Millennium BC sites in West India,Uzbekistan, Iran, Syria, Iraq and Israel. However, isolated examples of copper-zinc alloys are known in China from as early as the 5th Millennium BC. The compositions of these early “brass” objects are very variable and most have zinc contents of between 5% and 15% wt which is lower than in brass produced by cementation. These may be “natural alloys” manufactured by smelting zinc rich copper ores in reducing conditions. Many have similar tin contents to contemporary bronze artefacts and it is possible that some copper-zinc alloys were accidental and perhaps not even distinguished from copper.However the large number of copper-zinc alloys now known suggests that at least some were deliberately manufactured and many have zinc contents of more than 12% wt which would have resulted in a distinctive golden color. By the 8th–7th century BC Assyriancuneiform tablets mention the exploitation of the “copper of the mountains” and this may refer to “natural” brass.Oreichalkos, the Ancient Greek translation of this term, was later adapted to the Latinaurichalcum meaning “golden copper” which became the standard term for brass. In the 4th century BC Plato knew oreichalkos as rare and nearly as valuable as gold and Pliny describes how aurichalcum had come from Cypriotore deposits which had been exhausted by the 1st century AD. During the later part of first millennium BC the use of brass spread across a wide geographical area from Britain and Spain in the west to Iran, and India in the east. This seems to have been encouraged by exports and influence from the Middle-East and eastern Mediterranean where deliberate production of brass from metallic copper and zinc ores had been introduced. The 4th century BC writer Theopompus, quoted by Strabo, describes how heating earth from Andeira in Turkey produced “droplets of false silver”, probably metallic zinc, which could be used to turn copper into oreichalkos. In the 1st century BC the Greek Dioscoridesseems to have recognised a link between zinc minerals and brass describing how Cadmia (zinc oxide) was found on the walls of furnaces used to heat either zinc ore or copper and explaining that it can then be used to make brass. By the first century BC brass was available in sufficient supply to use as coinage in Phrygia and Bithynia, and after the Augustan currency reform of 23 BC it was also used to make Roman dupondiiand sestertii. The uniform use of brass for coinage and military equipment across theRoman world may indicate a degree of state involvement in the industry, and brass even seems to have been deliberately boycotted by Jewish communities in Palestine because of its association with Roman authority. Brass was produced by the cementation process where copper and zinc ore are heated together until zinc vapor is produced which reacts with the copper. There is good archaeological evidence for this process and crucibles used to produce brass by cementation have been found on Roman period sites including Xanten and Nidda in Germany, Lyon in France and at a number of sites in Britain. They vary in size from tiny acorn sized to large amphoraelike vessels but all have elevated levels of zinc on the interior and are lidded. They show no signs of slag or metalprills suggesting that zinc minerals were heated to produce zinc vapor which reacted with metallic copper in a solid state reaction. The fabric of these crucibles is porous, probably designed to prevent a build up of pressure, and many have small holes in the lids which may be designed to release pressure or to add additional zinc minerals near the end of the process. Dioscorides mentioned that zinc minerals were used for both the working and finishing of brass, perhaps suggesting secondary additions. Baptism of Christ on the 12th-century baptismal font at St Bartholomew’s Church, Liège. Little is known about the production of brass during the centuries immediately after the collapse of the Roman Empire. Disruption in the trade of tin for bronze from Western Europe may have contributed to the increasing popularity of brass in the east and by the 6th–7th centuries AD over 90% of copper alloy artefacts from Egypt were made of brass. However other alloys such as low tin bronze were also used and they vary depending on local cultural attitudes, the purpose of the metal and access to zinc, especially between the Islamic and Byzantine world. Conversely the use of true brass seems to have declined in Western Europe during this period in favour of gunmetals and other mixed alloys but by the end of the first Millennium AD brass artefacts are found in Scandinavian graves in Scotland, brass was being used in the manufacture of coins in Northumbria and there is archaeological and historical evidence for the production of brass in Germanyand The Low Countries areas rich in calamine ore which would remain important centres of brass making throughout the medievalperiod, especially Dinant – brass objects are still collectively known as dinanterie in French. 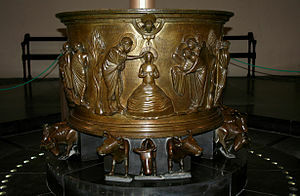 The baptismal font at St Bartholomew’s Church, Liège in modern Belgium (before 1117) is an outstanding masterpiece of Romanesque brass casting. The cementation process continued to be used but literary sources from both Europe and the Islamic world seem to describe variants of a higher temperature liquid process which took places in open-topped crucibles. Islamic cementation seems to have used zinc oxide known as tutiya or tutty rather than zinc ores for brass making resulting in a metal with lower iron impurities. A number of Islamic writers and the 13th century ItalianMarco Polo describe how this was obtained by sublimation from zinc ores and condensed onto clay or iron bars, archaeological examples of which have been identified at Kush in Iran. It could then be used for brass making or medicinal purposes. In 10th century Yemenal-Hamdani described how spreading al-iglimiya, probably zinc oxide, onto the surface of molten copper produced tutiya vapor which then reacted with the metal.The 13th century Iranian writer al-Kashanidescribes a more complex process whereby tutiya was mixed with raisins and gently roasted before being added to the surface of the molten metal. A temporary lid was added at this point presumably to minimise the escape of zinc vapor. In Europe a similar liquid process in open-topped crucibles took place which was probably less efficient than the Roman process and the use of the term tutty by Albertus Magnus in the 13th century suggests influence from Islamic technology. The 12th century German monk Theophilus described how preheated crucibles were one sixth filled with powdered calamine and charcoal then topped up with copper and charcoal before being melted, stirred then filled again. The final product was cast, then again melted with calamine. It has been suggested that this second melting may have taken place at a lower temperature to allow more zinc to be absorbed.Albertus Magnus noted that the “power” of both calamine and tutty could evaporate and described how the addition of powdered glasscould create a film to bind it to the metal. German brass making crucibles are known from Dortmund dating to the 10th century AD and from Soest and Schwerte in Westphalia dating to around the 13th century confirm Theophilus’ account, as they are open-topped, although ceramic discs from Soest may have served as loose lids which may have been used to reduce zinc evaporation, and have slag on the interior resulting from a liquid process. So at brúka orðið messing fyri brass er als ikki burturvið, men eftir míni meting tað einasta rætta útfrá tess givna samanhangi í I. Cor. 13.1. Og Zillah, hon eisini føddi Tubal-cáin, ein leiðbeinari hjá hvørjum listskapara í messing og jarni: og systir Tubal-cáins var Náamah. ( Longu í GENESIS arbeiddi Tubal-cáin við messing, t.e. málmblandingi av kopari og zinki!!! ) Wikipedia sigur eisini, at messing hevur verðið brúkt síðstu 5000 árini. Eg kann so siga teimum uppá Guðs orð, King James Heilagu Bíbliuna, at tað hevur verið til síðstu 6000 árini!!! Og tú skalt gera hornini hjá tí uppiá teimum fýra hjørnunum á tí: hans horn skulu vera av hinum sama: og tú skalt yvirklæða tað við messing. OG hann gjørdi brennioffurs-altarið av sjittim viði: fimm alnir var longdin á tí, og fimm alnir breiddin á tí; tað var fýrkantað; og tríggjar alnir hæddin á tí. 2 Og hann gjørdi hornini hjá tí á tey fýra hjørnini á tí; hornini hjá tí vóru av tí sama: og hann yvirklæddi tað við messing. 3 Og hann gjørdi øll reiðini hjá altarinum, pottarnar, og skuplurnar, og kørini, og kjøtkrókarnar, og eldpannurnar: øll reiðini hjá tí gjørdi hann av messing. Og Dávid og alt hús Ísraels spældu frammi fyri HARRANUM á alskyns ljóðførir, gjørd úr granntræi, enntá á hørpur, og á psaltrar, og á tamburinur, og á kornettir, og á skálatrummur. Menniskjan ongantíð so klók sum nú? Nei!! Menniskjan hevur ONGANTÍÐ verið so BÝTT sum nú!!!! Tí hon heldur SEG vera so klóka, og trýr ikki eingong Guðs orði. Eg trúgvi Guðs orði, og dríti á vitinskapin — falsliga sokallaða.